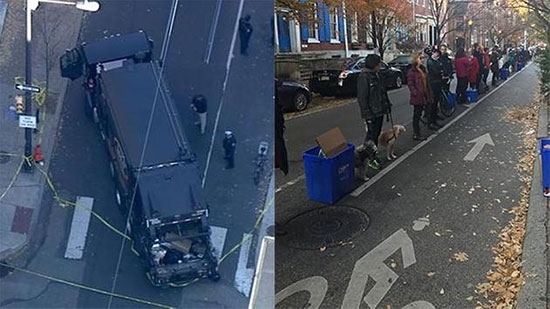 Philadelphia police have identified the female bicyclist killed yesterday in a crash involving a trash truck in Center City. 24-year-old Emily Fredericks was riding along Spruce Street near 11th Street and collided with a private sanitation truck turning right onto 11th Street about 7:30 a.m. on Tuesday. Crash investigators are still reconstructing exactly what happened. This morning, protestors lined the bike path along Spruce Street and created a human barrier between the bike and traffic lanes. They are calling for more protective measures along bikes lanes in the city. The first one-way protected bike lane in the city opened along a stretch of Chestnut Street in University City back at the end of August. That roadway features delineator posts and a parking lane to protect the bicyclists. The Bicycle Coalition of Greater Philadelphia will be holding a vigil for Fredericks tonight at 5 p.m. at 11th and Spruce. A Temple University student that was found unresponsive in the library has died. 24-year-old Michael Paytas of Holmes, PA was discovered unconscious on Monday in Paley Library. He was taken to Hahnemann University Hospital where he was pronounced dead. No foul play is suspected but the medical examiner will determine a cause of death. Paytas transferred to Temple from Delaware County Community College in 2014. Temple encourages students to visit Tuttleman Counseling Services. Little Egg Harbor police are investigating after finding over two dozen decapitated dead birds in trash bags in a wooded area over the weekend. Police were called out on Saturday to an area off of Winding Wood Drive near Route 9. They found trash bags containing 22 mutilated birds including roosters, hens, guinea hens, and pigeons. On Monday, they were called back to the same place and found bags with five more birds. If you have any information call Detective Joel Mahr at(609)296-3666 Ext. 178. Philadelphia's rejuvenated professional indoor lacrosse franchise announced its team name today after rounds of fan voting. The "Wings" are back in South Philly and will start play in next year's National Lacrosse League season.